The Philadelphia Flyers make their first trip back to Boston since opening night, back on October 8th, 2014, for a Saturday afternoon matinee. This is a pivotal matchup for both teams. The Philadelphia Flyers are fighting for the final wild card spot in the Eastern Conference along with the Florida Panthers; Boston currently holds a two-point margin over Florida, and a four-point cushion on Philly. With a Philly win, and a Florida win over the Islanders Saturday, these three teams would be tied for the final wild-card spot coming down the home stretch of the season. The Boston Bruins played host to the Calgary Flames Thursday night at TD Garden. The Bruins played well, but could not gain the extra point as they fell in the shootout to Calgary after eight rounds, with the final score being 4-3 in Calgary’s favor. The Philadelphia Flyers are 2-3 in their last five, with inexplicable losses to Carolina and Toronto over that five game span. On the flipside however Philly has also beaten the New York Rangers, and St. Louis Blues, which are two of the strongest teams in the NHL. As Philly is fighting for their playoff lives the Boston Bruins better be ready for some old-time hockey, as Saturday’s matchup will feel like a playoff atmosphere. Philadelphia’s, usual suspects will be up to the same old business as Jakub Voracek (65 pts. ), Claude Giroux (60 pts. ), Brayden Schenn (35 pts. ), and Wayne Simmonds (44 pts. ), will be the forces to stop as they look to generate most of Philly’s offensive firepower for the Flyers. Mark Streit (42 pts.) and Michael Del-Zotto (26 pts.) will be the two premiere Flyers defensemen to shutdown either the, Marchand-Bergeron-Smith line, or Lucic-Spooner-Pasternak line. Both lines have been very good for the Boston Bruins as of late as Marchand and Lucic are back to their pesky ways of hockey battling in corners, digging out lose pucks, and more importantly finding the back of the net again. 1. 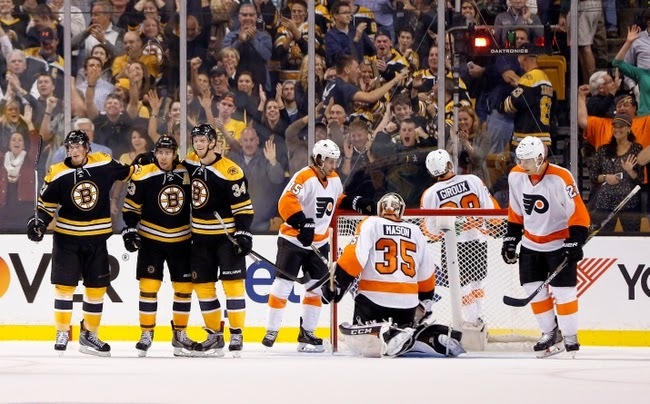 The Boston Bruins must get shots to the net on Flyers goalie Steve Mason who holds 2.24 goals against average. The Boston Bruins had 37 shots blocked by Calgary, which could cost a team a game as the Bruins found Thursday. Finding shooting lanes will be a major point of emphasis. 2. Boston must take advantage of the power play when they are on. The Philadelphia Flyers PK unit has the 3rd worst penalty kill percentage in the league at 76.7%. If Boston can generate offense on the power play verse a very below average PK unit Boston should have no issues scoring, which has been a problem during 5 on 5 play. 3. The last key to the game is Boston needs to have a strong third period. Boston has allowed 50 third period goals and only scored 42 in the third period. The Boston Bruins must complete a full sixty minutes of hockey and finish out games if they want any chance to make the playoffs. The playoffs start tomorrow for Boston not in a month because if Boston does not finish games there will be no playoff hockey end of story. Follow @BruinsLife for everything Bruins related!